Designed to make the job of policing on the front-line an easier task, the police vehicle merges the latest technologies with traditionally essential equipment into a single vehicle. 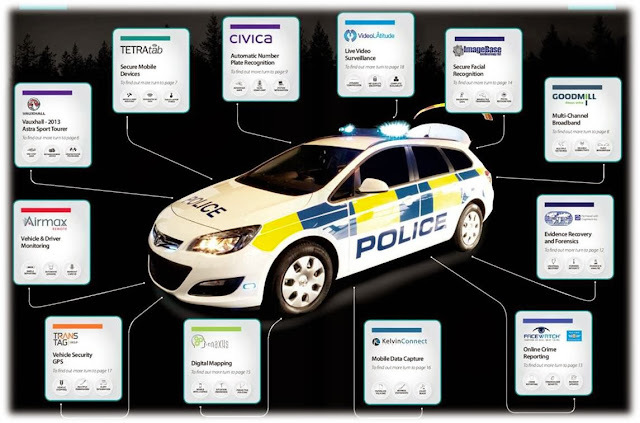 With multiple data and robust communications, the vehicle is able to support such solutions as GIS and mapping, police processes, ANPR, forensics, video streaming and capture, public involvement and facial recognition. The vehicle, as well as including automatic performance reporting and built in security measures, seamlessly brings together all of these technologies into one car. The CAST car is based on the Vauxhall (Opel) Astra Sports Tourer. This is a car that is widely selected by British police forces for its economic running costs and general robustness. The car is fully equipped with features familiar to the police, including full blue light arrangement, sirens, and features like ‘run-lock’. An important feature is that this cas is SVA (Single Vehicle Architecture) compliant. The solutions are designed to work in and away from the vehicle, creating a true mobile workforce environment. Vauxhall has teamed with Goodmill Systems and TETRAtab to implement the robust telecommunication and computing platform within the vehicle. There are two principle computers within the car, both of which are provided by TETRAtab. The telecommunications solution is provided by Goodmill Systems and integrated in the left hand side of the boot space. This allows any of the devices in the car, and when permitted, devices from the general public, to communicate via multiple freely selected broadband networks in a resilient and secure way. A WiFi hotspot bubble is also created by the router around the vehicle and is also connected via Ethernet to the TETRAtab platform. The vehicle includes video equipment that is provided by VideoLAttitude and allows video streaming from both inside and around the vehicle to any device in the world. The cameras are discreetly integrated so as not to attract attention, and are managed from two control boxes under the floor of the luggage compartment area. The car automatically reports vehicle faults abd druver performance via an Airmax system integrated into the car. This allows condition based maintenance of the vehicle and reduces the vehicle wear. This set-up was the winning solution of the ACPO ITS Group competition to produce a police patrol vehicle able to support new and innovative ways of working for the police service. The judges were extremely impressed with the whole vehicle fit and the final quality of the integration of so many disparate systems. 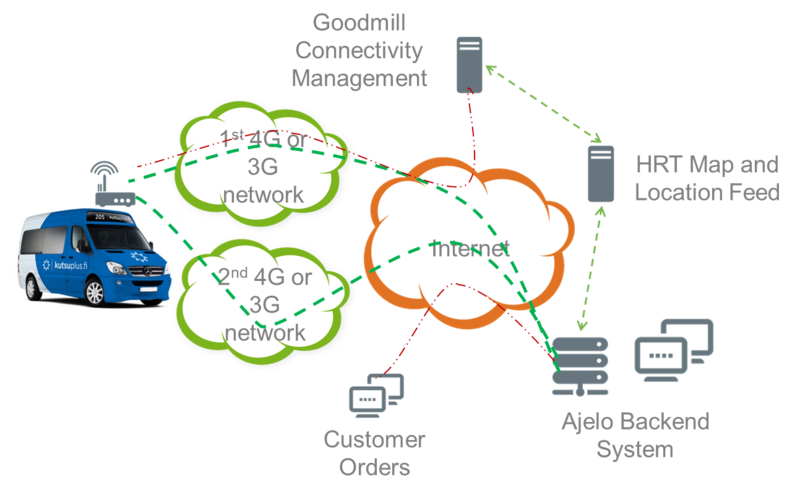 All systems worked seamlessly thanks to the high availability connectivity provided by Goodmill managed router system. Metropol project, which is a joint venture of HSL, Finnish Transport Agency, Aalto University, Ajelo Oy and Goodmill Systems Ltd., is developing a new demand responsive public transport service that offers individually tailored bus journeys with the help of a smart, real-time booking system. The service is being developed in a research project carried out by Aalto University School of Science and Technology. HSL (earlier HKL and YTV) has participated in the project since 2007. The aim is to launch a pilot of the service in the end of 2012. 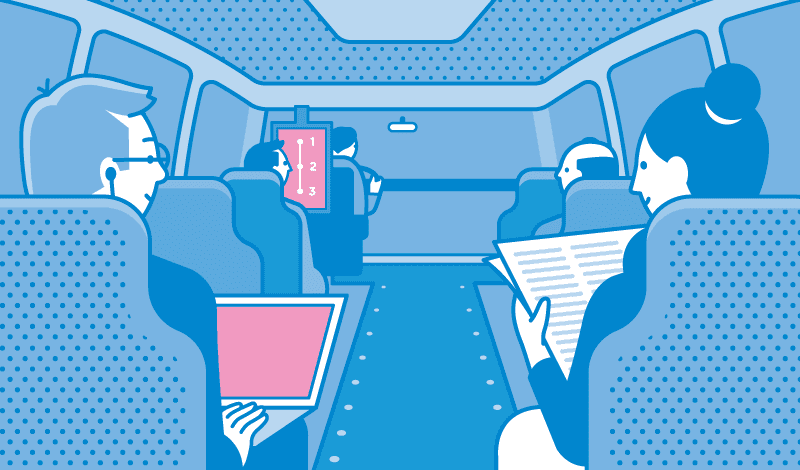 Customers can book a ride and travel from almost any location to another within the service area of the bus. The booking and control system is fully automated and all bookings are made over the internet or via SMS. Service level and price vary according to the customer’s choices. If the customer accepts that the departure time is adjusted to accommodate other passenger's and that the bus does not take the shortest route, the price is close to a regular public transport fare. If the customer wants to get a ride immediately and take the shortest possible route, the price is close to a taxi fare. In the pilot phase the service is operated by 10 minibuses. In addition, the aim is to cooperate with the taxi industry. The pilot area includes parts of Helsinki that lie south of Ring Road I excluding eastern Helsinki. The Viikki campus and Otaniemi are also included in the pilot. The preparation phase of the five-year pilot project will run until 2012 and the pilot will be carried out in 2012-2015.HSL will carry out the pilot in cooperation with the Finnish Traffic Agency, Aalto University, Ajelo Oy and Goodmill Systems Ltd. The vehicle equipment consists of a tablet computer which runs the application software. This has a critical connection to the backend system and updates the routes online as the rides change with new customers hopping in. The routes are shared on a bigger screen so that customers can see the route and their accepted arrival time just as in normal transport with predefined traffic plans. There is also a possibility for the WiFi hotspot and other customer experience enhancing services through the system. The technical requirements for the solution include the ordering and billing system, the algorithm based route planning that uses GPS information and a very reliable broadband connection that exchanges information between the vehicle and the system. Additionally customer services, like reliable wireless hotspot can be offered for the passengers. The imperative for the successful operation is the continuous GPS connectivity and the always online broadband to ensure that the logistics algorithms are always calculated based on the correct updated information. It is thus possible to alter the route and optimize it for the best possible customer experience. If the connectivity fails, the whole service is dysfunctional. It is thus additionally important that the connectivity can be monitored and all needed system set ups or upgrades can be done remotely. This means updates to the routers as well as updates to the vehicle computer systems. Metropol project is one of the spearhead projects outlined in the letter of intent between the Government and Helsinki region municipalities aiming to enhance the competitiveness of the metropolitan area. HSL’s aim is to create a high-quality public transport service that will attract a substantial number of motorists to public transport. If the system is widely introduced in the Helsinki region, the number of daily journeys made using the service could be in the hundreds of thousands within a decade. This would substantially reduce congestion from the use of private cars and need for large-scale road investments. The Executive Board of HSL decided on 29 March to propose to the General Assembly of HSL that it would grant Ajelo Oy a subordinated loan of EUR 400,000, provided that HSL's member municipalities grant a corresponding loan to HSL. The municipalities are committed to finance the five-year pilot with around EUR 5 million, of which operating costs are around EUR 4.5 million. Goodmill Systems Ltd. provides for the project the managed multichannel routing that is the enabler of this groundbreaking service. 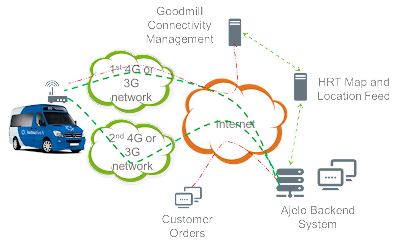 Goodmill offers the most reliable solution for vehicle broadband everywhere the connectivity plays a critical role. The modern ambulance services are introducing a variety of life saving applications that require always online broadband. Pirkanmaa Hospital District is one of the forerunners of high-end applications in this field. The hospital district needs to chart patients and share data in real-time, and easily manage Ambulance Trauma workflow and analyze patient data. Ultimately, the used applications help hospitals realize significant clinical and operational benefits to improve performance and quality. It is even possible to capture data using a finger touch-screen interface, and make charting quick, accurate, and comprehensive. The modern applications enable hospitals and staff to see the status of all patients, including real-time information from charting in the field. It is possible even to use workflow management system allows agencies to manage EMS through review and approvals, ultimately replacing the paper trail. The hospital district can then use pre-built server reports and powerful data analytics package to observe trends, and effect change. Ambulances are outfitted with docking stations and tablet PCs. Data is entered by tapping the screen, including voice recognition. Paramedic can send patient data in real-time the hospital and this system allows one to capture quickly and accurately far more information than manual on paper charts. The patient data is then instantly available to the emergency department and clinical audit staff. The system naturally requires data connectivity that is reliable, resilient and meets the challenging coverage problematic of a big country like Finland. Pirkanmaa Hospital District has chosen top of the field routing solution that is capable to switch from network to another seamlessly in a matter of seconds. For guaranteed availability, the routers system is remotely managed, and the solution includes state of the art mobile IP capabilities. The systems consist of routers, including mobile terminals, router software, management software and tunneling software. A picture of a concept set-up is presented below. 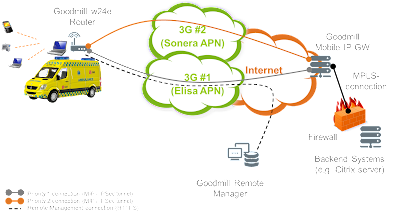 The figure shows that the hospital or command center can be connected to any vehicle through secured IPSec based VPN’s through a VPN gateway. This VPN gateway can be any of the currently commercially available standard gateways. In case of high-end video surveillance, a special mobile IP server is needed in the land site. This enables the extremely smooth switch over between networks with very little influence to picture quality or delay in picture. The WAN networks can be selected freely based on the availability of mobile terminals that are integrated in the router. In this case the most used Finnish Operators were selected to provide for the best possible combined coverage. The selection of used alternative WAN links is based on need for connectivity and cost. It is important to note that the solution provides a smooth transition to future dedicated broadband networks: when LTE is one of the selected modems, it will be used there where available. As the LTE network coverage grows, the usability increases flexibly. The services can be implemented immediately and upgraded as more broadband capacity will be available. In case of power loss, like in starting the vehicle, the router keeps power on for app. 20-30 seconds. Using multichannel routing is the killer enabler that meets the current and future needs of data connectivity in field use for Public Safety Sector. The solution enables the development of services and functionality in vehicles that is only limited by the coverage and data capacity limitations of the best availability that any single commercial network provides. Our experience is that the session’s persistency and the high availability needed can be provided only with our approach. The mobility of the vehicle influences the network functionality in such a way that it excludes currently available bundling solutions for this type of usage. The high end implementation of Pirkanmaa Hospital District system is a proof of the concept and the results can be seen with improved service and ultimately saved lives.